Student musicians perform a cover of "Dancing on my Own" by Robyn during school meeting on Grandparents Day. At New Hampton School, we contribute to the students' sense of self and community through cooperative, comprehensive, and specialized instruction in music. This approach infuses skills, knowledge, and character into New Hampton School's philosophically advanced global curriculum and ensures that the school will stay on the cutting edge of secondary private education in the country. 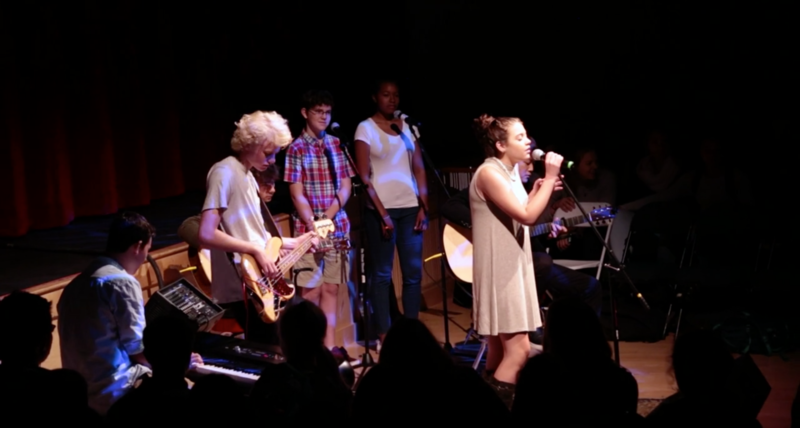 New Hampton School offers a wide variety of classes in music. Students can take classes in Guitar, Piano, Voice Lab (A cappella ensemble), Contemporary Performance Lab (Rock/Jazz Band), Introduction to Recording Techniques, Instrumental Lab (Instrumental Ensembles), and Music Theory. We have a vibrant private lessons program and can provide an appropriate instructor for each student's choice of instrument and skill set. Every year during Project Week, we travel to a major city to record at world class recording studios. We work hard to create opportunities for New Hampton School musicians to share and grow their talents by providing students opportunities to work with some of the most talented professionals in the music business. Please take a listen! We love to perform! There are numerous opportunities to do so throughout the academic year and our community is tremendously supportive of our musicians. A fully-equipped recording studio is available to all classes as a diagnostic tool to track progress and also as a means to create a professional quality recording. Our musicians regularly participate in state-wide and district festivals for Jazz, Orchestra, Band, and Chorus. Kyle Masterson received his B.S. in music education at Plymouth State University, and the Master of Music degree in voice performance at the New England Conservatory of Music. Kyle is the Director of Music at the New Hampton School and is a member of the voice faculty at Plymouth State University. Kyle, who joined the New Hampton School faculty in 2011, has previously held positions as Director of Choral Activities at Newfound Memorial Middle School and Director of Performing Arts at Tilton School. He has performed as a tenor soloist throughout the Northeast and has had the opportunity to collaborate with many wonderful musicians and ensembles including the Handel and Haydn Society of Boston, Blue Heron, Cut Circle, NH Master Chorale, and the Granite State Symphony. Kyle will be music directing the fall musical and will be facilitating the spring music co-curricular offering. Kyle resides off campus in Canterbury with his wife, Catherine, and his two boys, Carter and Ethan.